On how the Internet reaffirmed my faith in humanity. Because I am an eternal and hopeless optimist, I have never actually lost faith in humanity. To be sure, I’ve come close, but I have always held on to an unwavering conviction that humans are, in essence, good. I am a pacifist and a seeker of silver linings; I have been accused of bleeding sunshine and rainbows. What can I say? I’m a cancer and a blue; it’s a dangerous combination. Every now and again, something happens that makes me proud to be such a Pollyanna, and one of those every-now-and-agains has recently occurred. This summer, I was working with two of my closest colleagues, Sarah Mulhern Gross and Kelly Harmon, on something for our district. As is typical of those rare moments when we actually get to spend time together, we got to chatting. We voiced our concerns about our students’ increasing panic when they aren’t perfect. We have noticed that in the past few years, the tremendous pressure students put on themselves is getting more and more intense. We work in academically-rigorous high schools, and our freshmen come to us after being at the top of their middle school classes. Oftentimes, they have become accustomed to being perfect, and they are challenged for the first time in their lives when they get to us. We want to teach them to welcome that challenge and learn that they can overcome anything that life throws at them, but sometimes their fear of making a mess and letting themselves, their parents, or their teachers down is paralyzing. Being the bleeding hearts that we are, we decided to do something about it. 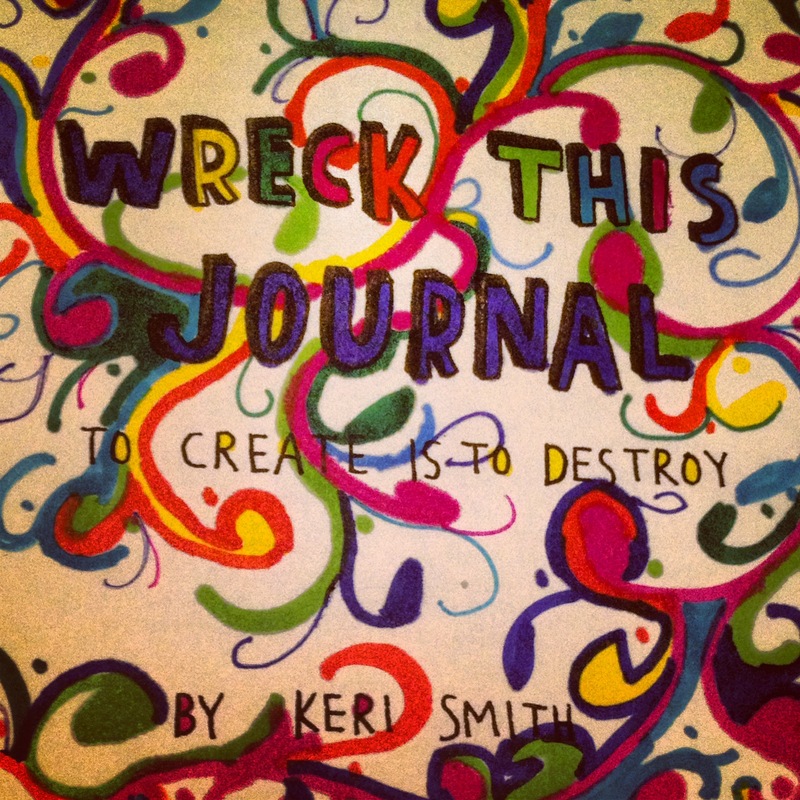 Somehow or other, we got on the topic of Keri Smith’s Wreck This Journal and how cathartic it could be. I’ve been working on mine since the spring, and I think it’s pretty cool, if I do say so myself! (EDIT: It’s not as cool now that I’ve seen this one.) We noted that it would be so amazing to get a class set of the journals for our freshmen. However, we knew that procuring materials in a public school system can sometimes be a lengthy process, so we wanted to find another way. Thus, our idea was born! The plan was simple; each of us would sign up on DonorsChoose and write a grant for a class set of Wreck This Journal. We’d highlight the fact that our STEM schools have no art classes, and our science-brained students often struggled with finding catharsis. We figured we’d at least get someone to donate something, right? We had no idea how right we’d be! Once we started writing our DonorsChoose grants (which you can find here, here, and here), we realized that we’d be short about twenty books in total. But more on that later. We got to work tweeting, facebooking, and emailing our links around in the hopes that someone would help. One morning, I figured I’d email Keri Smith, the author of Wreck This Journal and let her know about our project. I thought maybe she could put us in touch with someone who would help us get a group discount on the remaining twenty journals. No, she’s far too amazing for something like that. Instead, she posted on her blog and asked her readers to help out with the projects. That must be it, right? No. Not only did she personally donate to each of our projects, but she also found a way to ship me the twenty extra copies of the journals directly! Note: don’t read this and bombard her with requests for money and books now! She’s done enough; hit up someone else for your cause! 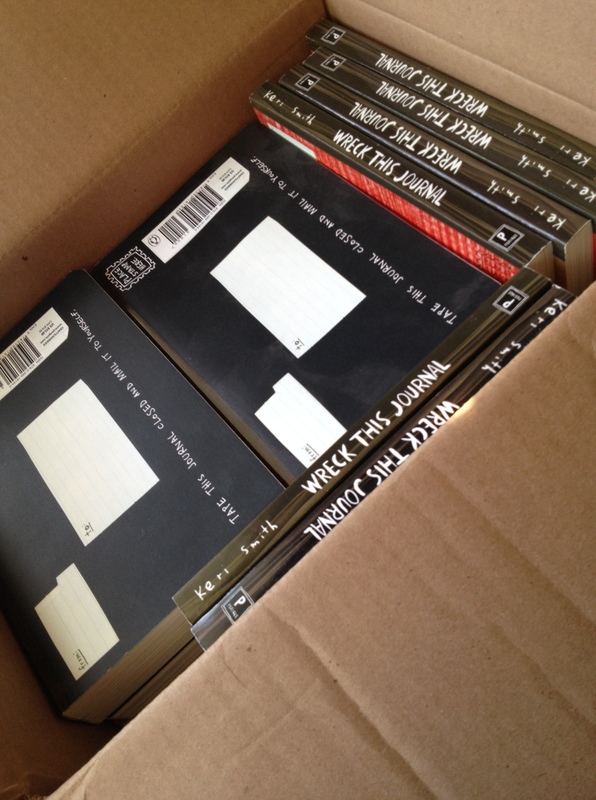 I seriously cannot WAIT to distribute these to students! It wasn’t long before Sarah’s grant was completed. Mine was next. I honestly couldn’t believe it. Many of my donors were friends and family, and it goes without saying that they’re amazing for supporting me and my students. Some contributors were anonymous, so I don’t even know who to thank. Not only that, but others were people I’ve never interacted with from all over the United States! Random strangers, for no reward other than to support a crazy project created from a five-minute conversation, were helping us teach our students that it’s ok…nay…it’s awesome to make mistakes! I’m pretty sure those were Keri’s readers; yay for the power of the Internet! I don’t know how this project will go throughout the year, but my instincts tell me that we’re on to something. The impact of these journals on our students will be enormous; I can feel it in my bones. You can bet I’ll be back here blogging about it once the DonorsChoose books arrive (the ones Keri sent are here and at the ready). But for now, all I can say is that they need this, and it wouldn’t be happening if it weren’t for the kindness of strangers. So thank you, dear Internet, whoever and wherever you are. Somewhere in the fourth dimension, Vonnegut is cheering you on.